Speaking at the success meet, Vishal thanked the Telugu audiences for being supportive right from the beginning of his career. Actor Vishal and director PS Mithran joined hands for a thriller subject in Irumbu Thirai which went on to become one of the bigger hits this season. Irumbu Thirai was later released in Telugu titled Abhimanyudu as a dubbed version. Abhimanyudu turned out to be a blockbuster hit and earned a collection of more than Rs.12 crores in the first week, highest for a dubbed film in Telugu. And to celebrate the success, the cast and crew of Abhimanyudu gathered in Hyderabad and interacted with the media. 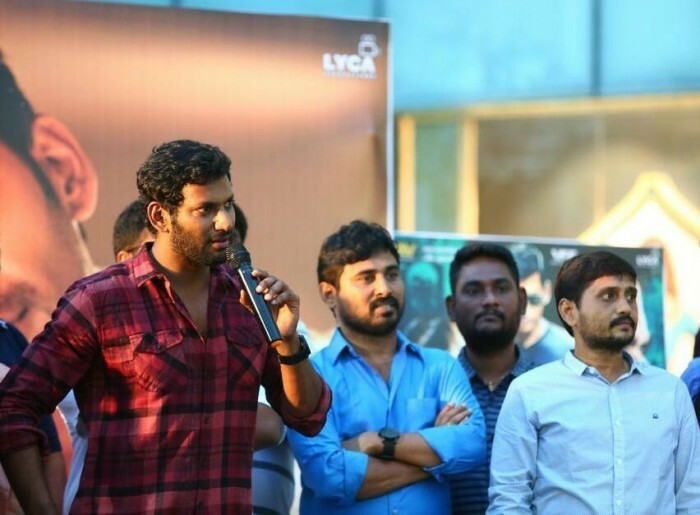 Speaking at the meet, Vishal thanked the Telugu audiences for being supportive right from the beginning of his career. “First of all, thanks to audience for making Abhimanyudu a blockbuster. Telugu audience has supported me right from the beginning of my career and this success gives me more energy and added more responsibility. We will start Abhimanyudu 2 with the same team very soon. My next film Pandem Kodi 2 will release for Vijayadasami,” said Vishal. Director PS Mithran says that he always believed that good content will always be appreciated. “Success of Abhimanyudu proves that a good film will be appreciated and becomes a huge success anywhere. I am very happy and thrilled to celebrate the success of the film among such a huge crowd,” he added. Starring actor Vishal, Samantha Akkineni and Action King Arjun Sarja in lead roles, Abhimanyudu released couple of weeks ago and is going strong with steady collections across all centers. Abhimanyudu is the Telugu version of Tamil film Irumbu Thirai which had a great run in Tamil as well. The Tamil version received rave reviews and was appreciated for picking up a subject which is currently a focal point in the nation. Irumbu Thirai is the first time that Vishal and Samantha Akkineni are pairing up for a film.